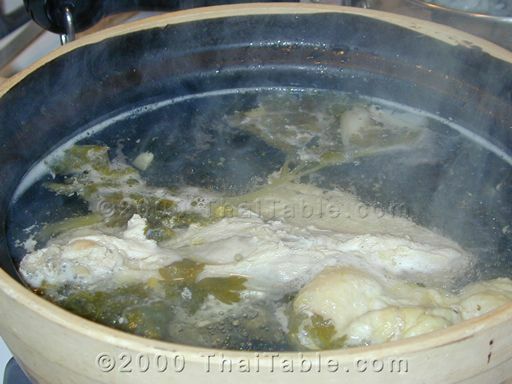 In Thailand, you can spot a Kow Mun Gai street vendor by the pale boiled chickens hanging by their necks in a glass case. 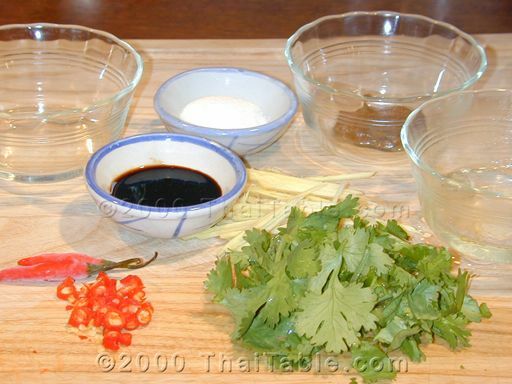 Kow Mun Gai is a very popular Thai lunch and also late night snack. When I was growing up, there was a very good Kow Mun Gai vendor near our house. Their Kow Mun Gai was great in large part because their sauce was punchy and strong. You could tell that they were popular. They started the morning with their glass case absolutely stuffed with the chickens. By the early afternoon, the chickens were all gone. Kow Mun Gai is supposed to be served with yellow bean sauce and winter melon soup. Many restaurants and street vendors now serve just the broth without winter melon to keep the costs down. If you want super flavorful rice, start with chicken bones, lots of them. Boil the chicken bones for at least one hour. Then when you’re ready to cook your rice, your soup will have great flavors. 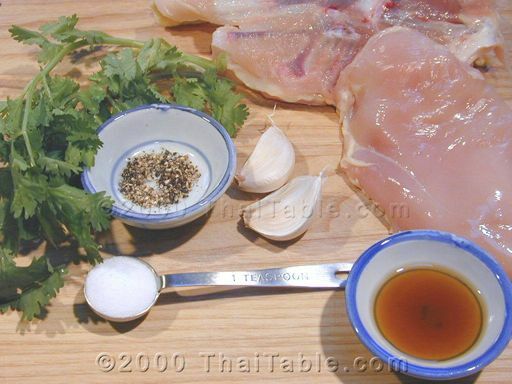 In Thailand, the chicken is served with skin on. I decided to go skinless because, we tend to remove the skin anyway. But if you love the skin, go for it. Another secret to get flavorful rice is garlic, add a handful in with the rice. If you’d rather cook your rice in the rice cooker, you can add the rice and broth into the rice cooker after cooking in oil. Or, if you looking for shortcuts, add the rice, oil, garlic and broth in the rice cooker altogether. 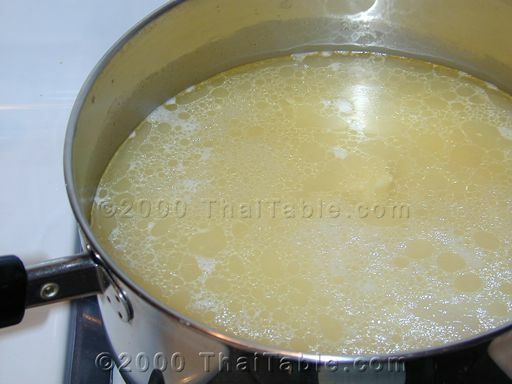 Add the oil to a pot, pour rice in. Stir to coat the rice with oil. You can see the rice starts to turn whiter. Add 7 cloves of garlic. Cook the rice for a minute more. You can see the garlic start to get cooked. Add about almost a cup of chicken broth to the rice. 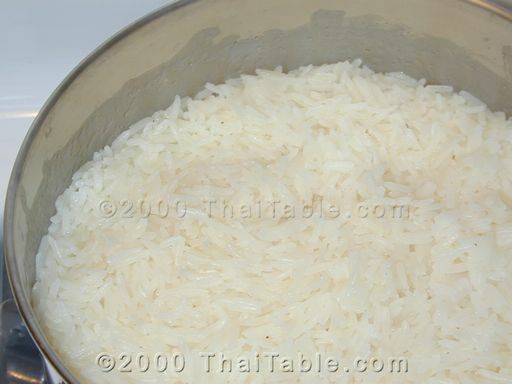 The ratio of rice to water is almost one to one, less water. Especially, new crop of rice has more water content. So, reduce the water by 10%. You want the rice to fluffy, not mushy. When the rice is boiled, turn down heat to the lowest heat available on your stove. Close the lid and let it cook until tender. It should take about 15 minutes or so. 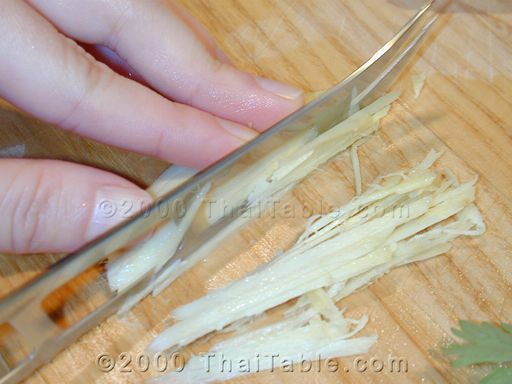 If you decided to add winter melon, remove the hard skin and cut the melon into big chunks, 2 inches by 3 inches. Drop the melon in the broth. Let it simmer until tender. You can also keep it simmering for a long time. 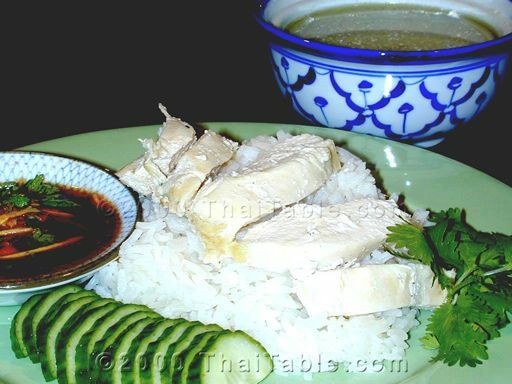 To serve, put rice on a plate and top with sliced chicken. 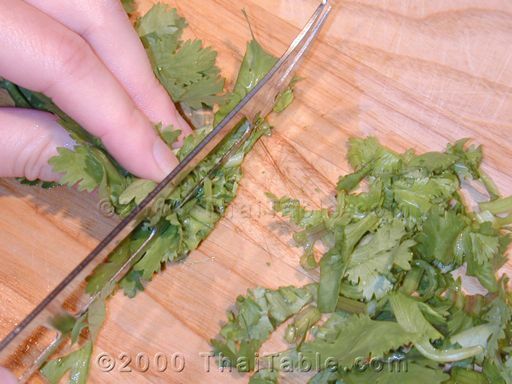 Add sliced cucumber. Sprinkle cilantro on top of chicken and soup. 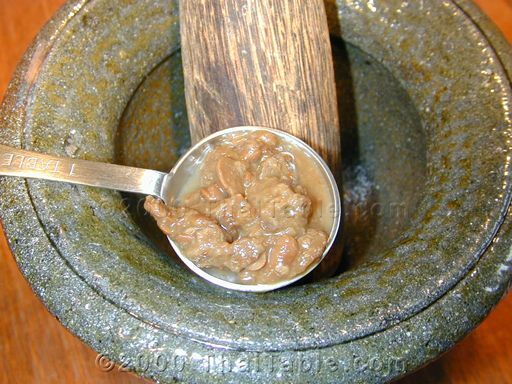 Serve with hot yellow bean sauce in a small bowl and a separate bowl of soup. For kids, serve the rice and chicken with dark sweet soy sauce.